Gamers tend to take their “vocation” seriously, as bragging rights are up for stake with winners feeling that nice, warm glow all over while losers look at their mouse and start cursing. That’s right – watch any average gamer duke it out with the rest of their mates at a LAN party and you’ll realize that the losing side tend to be more frustrated in terms of body language, sending forth a smattering of cuss words alongside banging the mouse on the table, touting that they missed that crucial shot due to being let down by inferior gaming hardware. 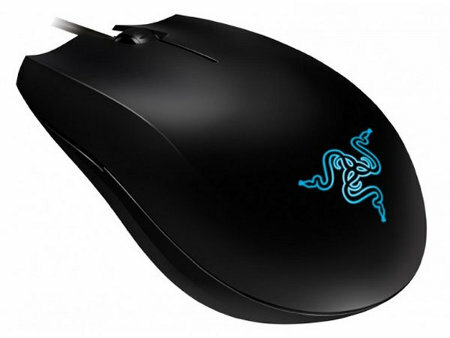 Razer has been in the business long enough to know what they’re doing, and their latest release would be the Razer Abyssus gaming mouse that target those who are new to the world of gaming and want a feel of what professional gaming equipment is like before diving headlong later on with the gaming bug going at full steam ahead. The Razer Abyssus gaming mouse will merge both simplicity with a state-of-the-art 3.5G 3500dpi infrared sensor to make sure you can make the shot just about any and every time as long as you have the ability to do so. Targeting gamers who demand reliability and functionality under the fiercest gameplay conditions, the Razer Abyssus will come equipped with a couple of large non-slip buttons that have been tuned for maximum tactile feedback, featuring Razer’s built-in Hyperesponse technology. Located underneath, Razer has placed a couple of easily accessible mechanical switches, where one of them is used for on-the-fly dpi switching for a choice of 450, 1800, or 3500dpi, while the other offers a polling rate switch that enables instant adjustment from a standard 125hz to 1000hz Ultrapolling. Expect the Razer Abyssus to hit North America for $49.99, while our friends living across the Atlantic have it slightly cheaper (dollar-for-dollar) at €39.99. As for the other regions of the world, they’ll just have to wait until later next month – hopefully in time for the holiday season.